The Short Version: Arizona longballs doomed the Reds in Sunday’s series finale, but the Reds still won two of three. So that’s not bad. –Jose Peraza had a triple and a single, plus a run scored. Eugenio Suarez had two hits and a run scored, as well. –As we’ve seen so many times this season, Luis Castillo looked awfully good for large swaths of this game, but the longball contributed to a final stat line that was not good: 5.2 innings pitched, 5 runs allowed on 5 hits and a walk, with 7 strikeouts. It was two home runs, one in the first and one in the sixth that scored all the Arizona runs and lost the game. 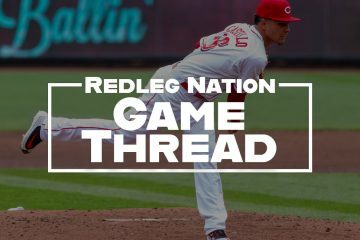 –Keury Mella was pretty ineffective in his two innings of work: four runs allowed on five hits — three homers allowed — and a walk. Mella’s big league ERA is now 8.68. –Reds took two of three from Arizona. 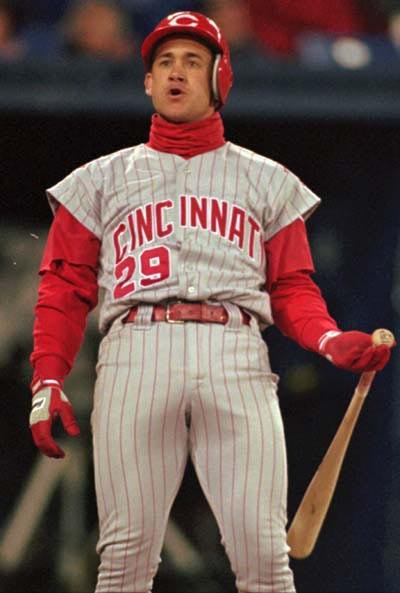 I couldn’t think of anything clever to say about this game, so I added a photo of Bret Boone above. I dunno…it’s been a long season, give me a break. 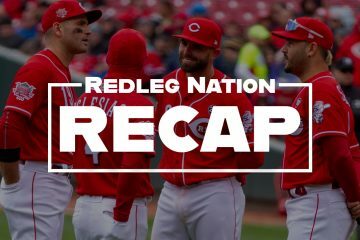 –Quickly down 3-0, the Reds tried to chip away. In the bottom of the second, Eugenio Suarez and Mason Williams led off with singles. Suarez scored when Preston Tucker grounded into a fielder’s choice and Arizona SS Nick Ahmed threw the ball away. One inning later, the Reds got another run back. Jose Peraza tripled with one out and scored on a Joey Votto sacrifice fly to make the score 3-2, Arizona. –The Cleveland Indians come to town tomorrow. Homer Bailey will pitch for the home team. Luis Castillo has ace stuff. Just needs experience and consistency. Reds have control of Luis Castillo’s contract for five more seasons after this one. Through 2023. Marlins traded him for Dan Straily. Reds also got Anthony DeSclafani from Marlins for Mat Latos. I notice the home run in the first inning was on an 0-2 pitch, so needed a put away pitch there from Castillo, to either strike out the batter or getting him to chase something out of the zone. Also, Goldschmidt very dangerous hitter…should not get any fastballs pitched to him. I actually thought it was a pretty decent pitch, 96mph fastball down and away. Nice piece of hitting by Descalso to go down and get it. I don’t know how many homers have been hit off his changeup, but I doubt it has been many. He needs to throw it 0-2, 1-2, 2-, you get the picture…..until the league can adjust. If he wants to throw a fastball, aim it at the cather’s mask, or just above the strike zone. Just read the postgame, apparently it was supposed to be down and in. I thought it was further outside and higher than it was. Not a good pitch, after watching the replay. It was a decently located pitch low and away though not right on the corner. Might have been a mixup in communication between Barnhart and Castillo however….catcher initially set up right where Castillo threw the ball. Before the actual pitch, Barnhart moved the glove to inside mid level. Descalso might have peeked back caught the initial location set up by Barnhart and expected a pitch there. The homer by Goldschmidt was a GASP joke, a popup that drifted barely out of the park. A pitcher who cares about their numbers would never sign up to pitch in GASP (or Colorado). Highly doubtful any sabermetrics take the time or care to adjust enough or properly account for the homer inflation in this ballpark. Goldschmidt got 2 fastballs in a row. I did not see Castillo shake him off. Castillo will be ok. Descalso 3 run HR are painful. Goldschmidt is the best first baseman in the NL. Joey Votto is still my second fav Red ever behind Johnny Bench. Time to admit the obvious. No one cares about the Reds anymore in 2018 x about 1200 folks. NFL is starting. School is starting . Winker/Senzel/Greene/Trammell are injured. Not much to get excited about. I hope BC and the FO don’t try to manufcature news with their marketing team. After that road trip, taking 2 of 3 and a series win, there are no complaints. Castillo is just having one of those sophomore years. Got to be ready for Cleveland, but with NL rules this time around. Might be catching the fading SF Giants at a good time after that. I didn’t see a good home stand coming, but it could happen. Something is wrong with Votto. He has no aggressive swings, everything is half-checked, spray the ball opposite field swings. I havenÃ¢â‚¬â„¢t seen him take a good rip at a ball in months. Will be interesting to see what off season news there is regarding him since itÃ¢â‚¬â„¢s so hush hush from media and Reds. Of course, no mention of it here as well, but Thom mentioned the 2 extrabase hits since AS break and others commented in the game thread about his lack of power. Votto my favorite Red since Larkin and I hope he is the next to go into the Hall, but he needs two more all star years (pre 2018) and some power numbers to help his case. HereÃ¢â‚¬â„¢s hoping there is a quiet injury not being discussed and 2018 is not a tribute to Father Time. His age is starting to show. I believe many felt his OBP would tail off gradually but his power maintain longer. Instead it appears his power has disappeared almost overnight. It is remarkable to witness him using his guile and skills to sustain the OBP he has been able to build so far. It will be interesting to see what approach he adopts next season given the off season to assess and hone what skills he has left. As stated the inside out swing has been there all year long.I still feel he can maintain his obp by walking and hitting singles all day long to left field which is basically what he has done all year long.The last ball he turned on and hit with any power was the homer he smoked in the All Star game.He is now a number 2 hitter which is ok and I do expect he will make some adjustments in the off season.To me he never was a power hitter but rather just a great hitter that took advantage of playing in GABP where he could reach the seats in left easier then the pull side.Winker is the next Votto especially if his shoulder gets fixed.He is the next star along with Suarez on this team. IÃ¢â‚¬â„¢m good with him getting his hits regardless. Just stating that to go from a 30ish hr hitter to 15 (if he gets there) is a much steeper fall than projected. Just doesnÃ¢â‚¬â„¢t look himself. Even his oppo hits that heÃ¢â‚¬â„¢s doing a good job collecting are very soft liners or bloop fly balls. I obviously don’t know, but I have a hard time believing that his power would disappear so suddenly in the absence of an injury. A gradual decline is predictable, but falling off a cliff is an anomaly. Also, isn’t aging essentially a process of nontraumatic injury? Good points, Jim. I was thinking of loss of strength, which is gradual and can be made more gradual still by working out, but probably it has to do more with bat speed/reflexes. I expect, at the MLB level, the difference between hitting and missing is tiny. And I agree that Rose knows hitting and that aging is non-traumatic (and sometimes traumatic) injury. Boy, how I agree! Something is wrong with Votto. Nothing is wrong with him. It’s just called “getting older”. What, did you think he was always going to be a 30HR, .450 OBP machine? He’s 34, and has already held off the aging curve longer than average. But the truth is, age catches up with everyone eventually, even Joey Votto. If you watch him, you can see he has a hard time catching up with some fastballs now, and he’s starting to “cheat” a little in his swing, which robs him of his power. I will be shocked if he ever hits 20 HR in a season again. This kind of proves how much of a flawed stat that wRC is, if it thinks that Votto is having a better 2nd half than Suarez. How is wRC a flawed stat? What stat should be utilized in your opinion that is not flawed? .427 OBP. He’s getting on base and scoring (dependent stat), but the observation was that he is not hitting with power. And he’s not. Amen. Not taking into account the importance of an at bat is a major major flaw of wRC+ and points toward the lack of correlation between wRC+ and the value of one’s offensive output for the team. You sort of skipped over my example before. A huge amount of offensive output takes place outside the counting stat of RBI. wRC+ captures that. If “hitting in important situations” is no more predictive in value than “hitting on Thursdays” then why is leaving that out a major weakness? You have to establish there is such a skill as “clutch hitting” first. Lots of researchers have tried to prove/find that, with no success. Luck plays a huge part in outcomes. You also can’t predict luck. Quantum mechanical nature of the universe. If you want to measure individual offensive achievement, maybe wRC+ is a decent metric. If you want to measure contribution toward team success, you have to care about efficiency of scoring runs, efficiency of driving runs in, of advancing runners even if the ABs produce outs, and the speed that enables some of the runs that are scored. The single that Votto hit to drive in Billy from second was a clutch hit; however, I don’t think any other Reds runner scores on that hit. Most reds would have been held up at third, maybe Peraza gets sent home and is thrown out at the plate. Votto is hitting .291 since the break, compared to Suarez (.272). Votto also has walked a lot more (21.6% compared to 5.6%). So his OBP is .459 compared to Suarez at .322. Suarez has definitely hit for more power. If you have a reason why wRC+ is a flawed way to represent offensive production, please explain what it is. All ABs are treated the same. That’s the major flaw with wRC+. It might be the best stat that’s readily available, but it itself is a product of the limitations of the input variables. Regardless of how many runners are on base. Regardless of the relative importance of the AB toward the outcome of the game. Regardless of the score at the time of the AB. Lots of adjustments would be necessary to make wRC+ more relevant. Not saying it lacks any value whatsoever. Just wouldn’t emphasize wRC+ so much. You already have OBP to get at the heart of one’s ability to get on base. RBI by itself, without an additional calculation to get toward efficiency, is flawed. An average involving total bases including runners on base would get to the heart of weighting an AB by importance but I don’t know of any readily available baseball stats to take this into consideration. (Grand slam equals 10 for 10, K with bases loaded is 0 for 10, a walk in that situation is 4 for 10). You can probably think of better stats too. The flaw if anything is the idea that it is possible to reduce and summarize everything down to one simple output that provides value toward measuring the relative importance of one player versus another. Baseball, like life, is a little more complicated. That’s not an inherent problem with wRC+ because it’s trivially easy to separate out high leverage at bats and calculate the wRC+ for that. It’s a question of whether there’s any meaning in looking at high leverage at bats separately. If it’s not a separate skill set, then why bother? It’s just a misleading small sample of plate appearances. If a batter leads off an inning with a double (or walk) in a one-run game, he doesn’t get an RBI, but it’s extremely important for offensive output. You need a weighted average calculation. Yes, “in decline” Joey Votto leads the Reds in offensive output WITH RUNNERS IN SCORING POSITION. Kind of a different narrative than you hear nightly from the Reds play-by-play announcers, especially in relation to Scooter Gennett. That lead-off double is only important if he ends up scoring. Not something that he can control, I realize, but the outcome of the game is the stat that trumps all others. It’s regression to his career norms, especially against lefties. Now he likely isn’t as bad as he’s been the last month, but his season numbers are still platformed by that inhuman May. Castillo and the rest of this staff continue to struggle keeping the ball in the park especially at home and it looks like they will give up 200+ homers this year.This will have to improve and I think it will but we do play in the home of the wall scraping first row home run.Our offense is #12 in hitting homers with only 3 teams worse yet set at # 2 in obp and # 7 in runs scored which is middle of the pack.The Reds get a lot of hits(#3) and walks but in my opinion must improve power wise in 2019.We just can’t continue to get out homered especially at GABP regardless of how bad we pitch.Today was a classic example of a lot of our games at home.We only got out hit 10 to 7 but they had 5 home runs and well we had none.I went back and checked and in our now 66 losses we scored 3 runs or less in 39 of those games which is surprising for a team that is #7 in runs scored.There is no doubt our pitching has been bad and there is no doubt for this team to improve it must get much better but I just think we have more work to be concerned with then just the pitching.I just don’t see that we are good enough on offense especially our lack of power. Good points. This is new problem. Getting hits and base runners but not runs. Votto (18 version), Peraza and Hamilton make this power outage a bit of a concern. IÃ¢â‚¬â„¢ve seen more games lost while leading the hit category this season than in any other. IÃ¢â‚¬â„¢m not worried about Castillo. His line yesterday shows a WHIP near 1.00 (5 hits, 1 walk in 5.2 innings) and 7 strikeouts. His fastball was in the high 90s and offspeed in the mid 80s. ThatÃ¢â‚¬â„¢s great separation. And despite a 27-pitch first inning, he was at only 88 pitches when he got removed yesterday. And this was against a likely playoff team. This was a FAR better start than I saw out of Mahle his last few outings before being sent down. Mahle nibbled and missed, ran up his pitch count, and didnÃ¢â‚¬â„¢t have a put-away pitch. ThatÃ¢â‚¬â„¢s far more concerning. And Castillo has looked better than 5-inning Sal, too. GoldschmidtÃ¢â‚¬â„¢s HR was a GABP special. DeScalsoÃ¢â‚¬â„¢s HR was on an 0-2 mistake. IÃ¢â‚¬â„¢m NOT making excuses. IÃ¢â‚¬â„¢m saying that Castillo just needs a little cleanup. IÃ¢â‚¬â„¢m far less worried about him than I am about Mahle or WalkAThon Stephenson. I like Barnhart but that was a dumb pitch to Goldschmidt. Whoever called it anyway? He leads the NL (or mlb?) in oppo HRs so pitching him high & away is pretty stupid. Its kind of hard to pull 97 mph when you’re looking away so pitch him inside. I wonder what Tucker’s era is compared to Casili? I’ve seen a lot of dumb pitches called situationally this year with Barnhart behind the plate? The 0-2 was just a mistake but 3 runs hurt. Overall I agree with you though….nothing Castillo can’t clean up moving forward! I’m interested in see this Sims kid! The word is that he has a big curve and pitches kind of backwards which the Reds could use more of imo! He might be a steal for Duvall? The last I heard, Casili had a better ERA than Barnhart. Small sample, of course. The reason for Votto’s decline is simple. I took him with my first round pick in our fantasy league. He immediately started working on that stupid defensive inside out swing. I think he has almost perfected it. 9 HR’s. Sheesh!!!! 4 in a row in April or May. One of the 9 homers came off a position player throwing in the 80s at the end of a blowout. The decline was inevitable….but after the early success, very sudden and unanticipated. Next 6 years might be brutal. However, if Winker’s shoulder surgery goes well, JW should replace Votto’s $25MM production at well below market cost (which is a travesty to Winker). If Winker starts winning MVPs then he can get $25 million a year too. Votto didn’t make $25 million his rookie season. You can debate if that is fair to the players or not, but league minimum is what the rules the players and owners both agreed to in the collective bargaining agreement for the first few years of service time. You could save yourself a lot of time if you just posted. “I don’t like Votto” and stopped trying to make arguments about pay or clutch hitting.